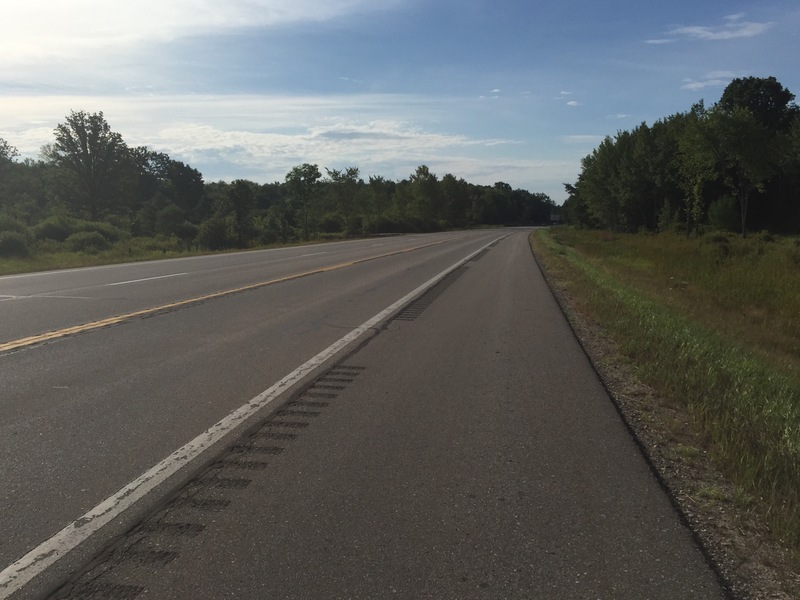 Day 50, 8/2, Sunrise Lake State Forest Campground, LeRoy, MI to Bay City, MI: 88.9 miles, 1,420 ft elevation gain, 13.3 mph average speed. 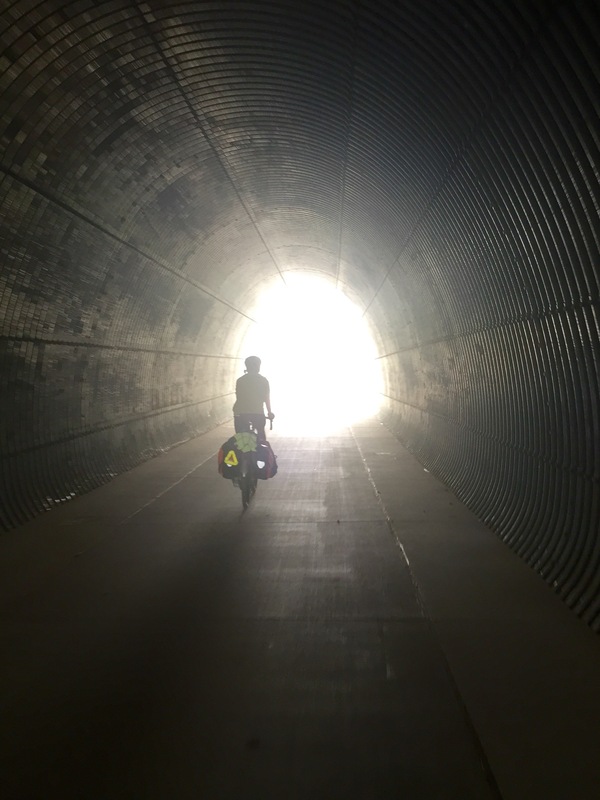 Trip totals: 3,111.8 miles (72.4 mile daily average), 127,106 ft elevation gain, 12.5 mph overall average speed. We woke up a little before Richard and left camp before he was fully packed. The day started out with about 20 miles of rolling hills before we got to an intersection with a cafe called Four Corners or something to that effect. We looked back and Richard had caught up to us. Now, the man is traveling very light and he is on a road bike and he did have a long and successful career in the military, but he’s in his upper 60s! Granted, it takes us some time to warm up in the morning, but this was a little embarrassing. We sat down to breakfast with Richard and he regaled us with more stories of the incredible life he’s led, but he speaks without a hint of pretense, a surprising quality for a guy who has accomplished and experienced so much. Richard is an impressive person in a number of ways, but the most impressive thing about him is his humility. During breakfast we decided to leave the route to save eight miles. 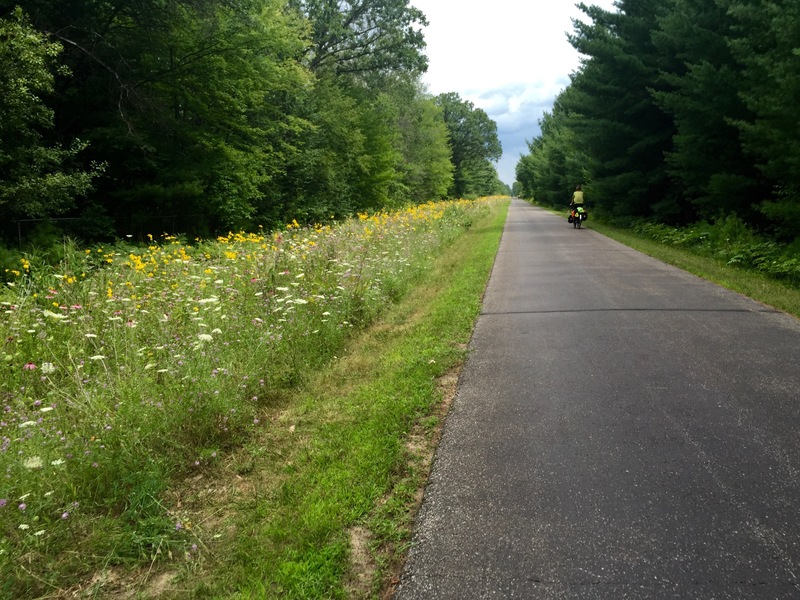 The road we chose was busier than ACA’s route, but also flatter, so I think it was a good decision. Nothing remarkable on this section of road. 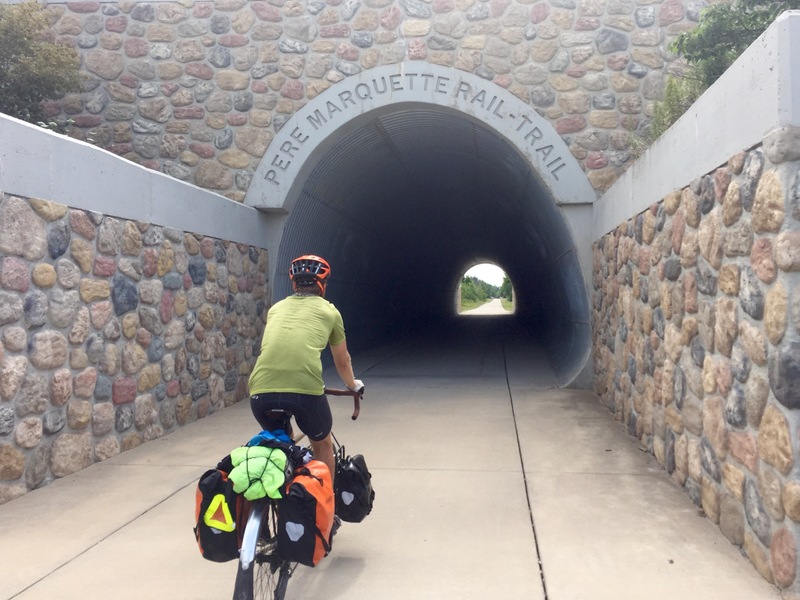 We then turned off of the highway and onto the Pere Marquette Rail Trail, a paved bike path that brought us all the way to Midland – 35 miles of car-free riding! The trail was well-maintained and well-used on a Sunday. 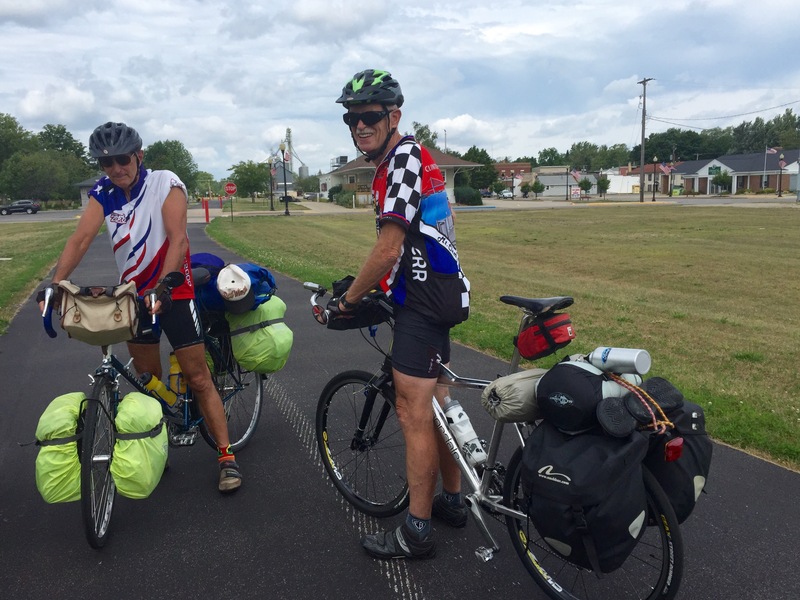 We met a couple of men who appeared to be in their late 60s, native Michiganders doing a bike tour around Michigan who were very concerned about how their state was treating us. We whined about the poor roads (a complaint about which they agreed), but said that it’s been great otherwise. We planned to stop in Midland for lunch, but we came across an ice cream shop before town with a beautiful yard that had outdoor seating that seemed to cater to people riding on the trail. We stopped and decided to eat our typical lunch (Triscuits with tuna and cheddar cheese plus whatever fruits and junk food we had on hand) then get ice cream. After we finished eating, we noticed Richard and Maarten riding together down the trail. Apparently Richard had caught up with Maarten on the trail, so we’re not the only young bucks getting our butts kicked by Richard. They turned back around to say hi, we chatted for a bit, and they left. 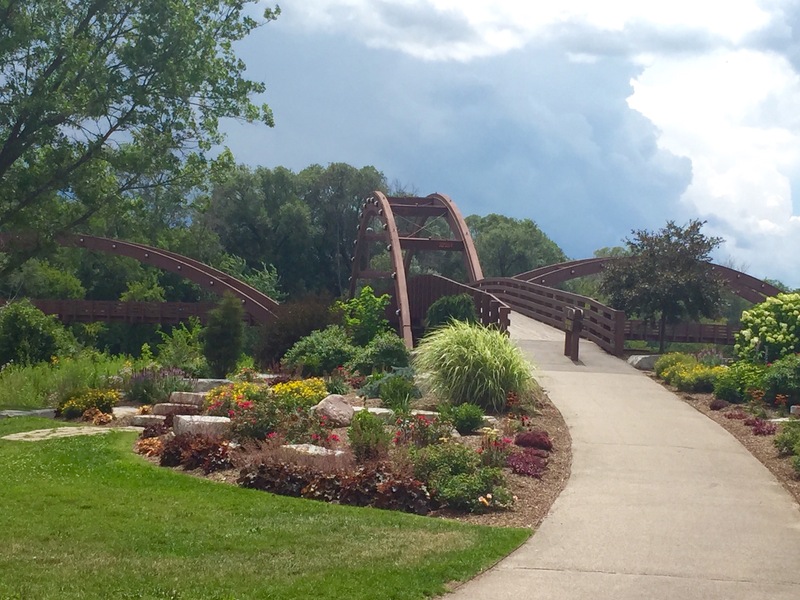 We decided to look into the campground in our planned final destination, Frankenmuth, and found out that the campground in question was the Jellystone Park RV Resort, which charged $49 for a tent site, after a cyclist’s discount! I guess they have a pool and a bunch of games or something? I don’t know, but we were not going to find out. Camping in Michigan has been pricey, but $49 is outrageous. We’ve paid less than that for a nice motel! Commence desperate search for other campgrounds and cheap motels. 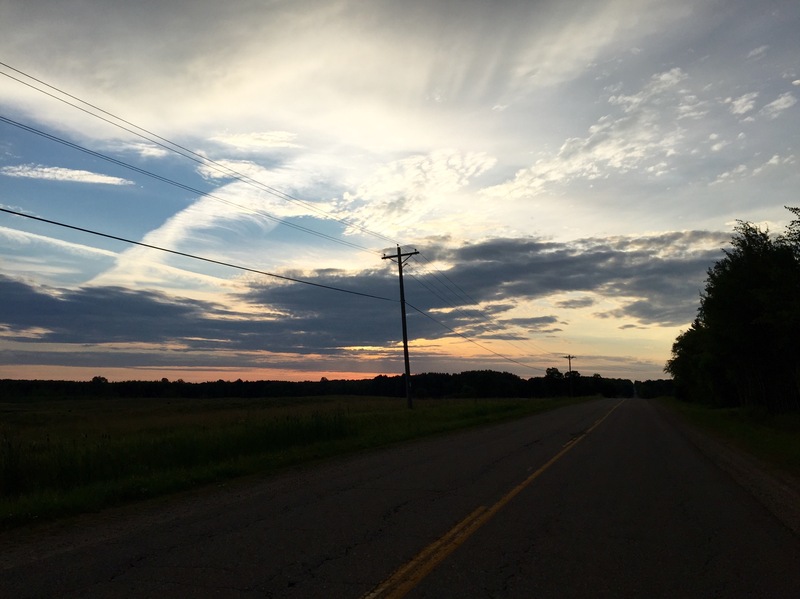 Turns out Frankenmuth is a tourist town so there were no cheap anythings and the next campground was 15 miles past Framkenmuth, which would have made for a 140-mile day, which we decided was beyond our threshold. We debated going to Frankenmuth and chatting with folks at the brewery to see if they’d be willing to let us camp in their yards, but neither of us is very outgoing with strangers and we both really hate asking people for things. So we decided to, yet again, stop short of our goal in Bay City, which was just 20 miles up the road. 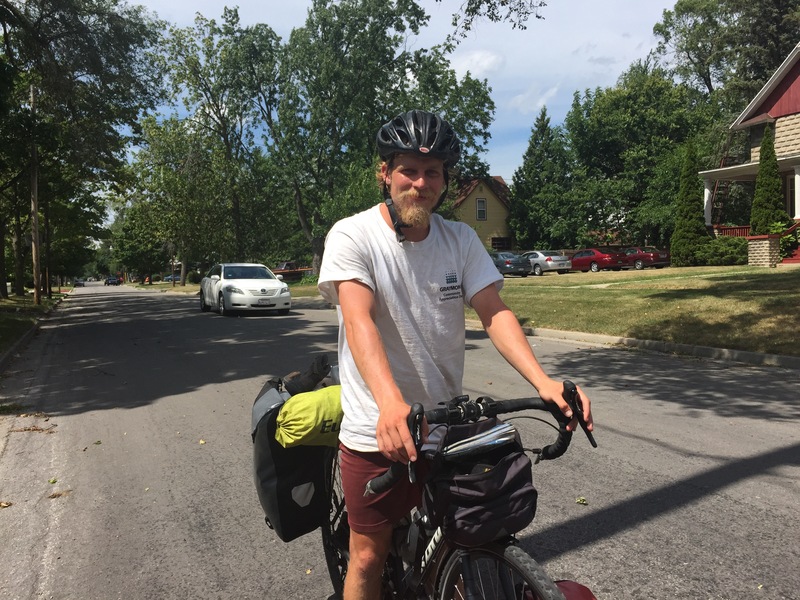 This is the third day of not meeting our goal, which, besides the fact that it’s not fun to fail to meet goals, means we will not be able to make up that last day we lost in Glacier before meeting Ted’s family in Niagra-on-the-Lake. We stopped at Ray’s Bike Shop in Midland to pick up a new tube for Ted’s bike and chain lube. When we walked in, the guy working there was super excited about our tour and said that we could have priority in the shop of we needed work done, that we could fill all of our water bottles with cold spring water, and that they’d love to do whatever they can to help us. The mechanic then gave Ted three nice tubes for free, so we decided that we’d like to support such a wonderful shop by each buying some much needed bike gloves! Oh my gosh, these bike gloves have made such a difference already. Our old gloves were missing padding at the spots we needed it most, but we were just being cheap and living with it. We became so used to the discomfort that we both went on and on about how angry we were at ourselves for not buying new gloves earlier. I don’t think we realized that it was possible not to have constant pain and numbness in our hands on this trip! 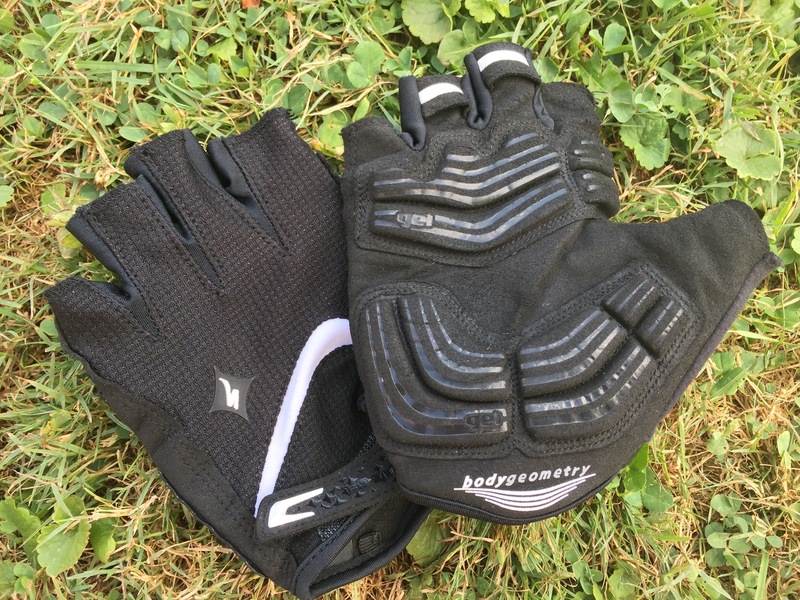 So if you plan to do a bike tour, definitely spend a little money on nice bike gloves. 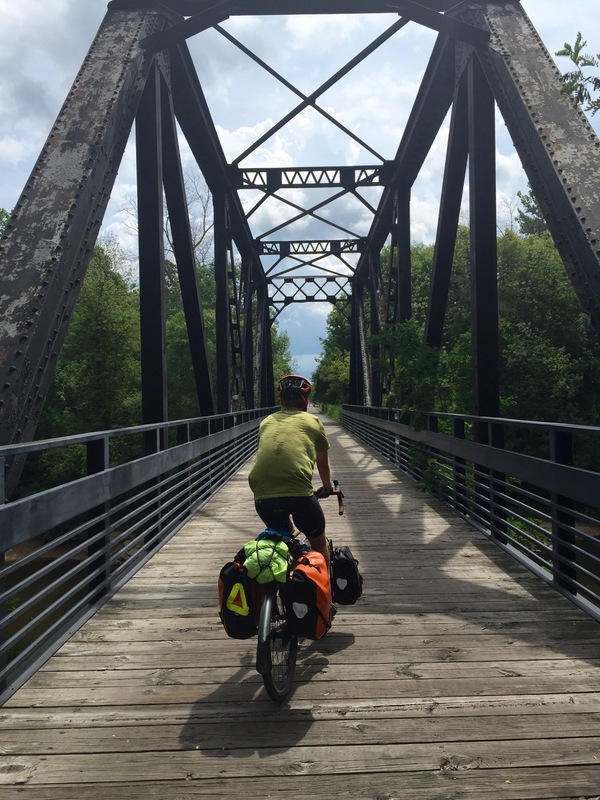 We rode the final 15 miles to Bay City and bought things for dinner at a giant grocery store. We noticed some ominous looking clouds on our way to the campsite, so Ted checked the weather. Severe storm warning and a 90 percent chance of rain all night. The rain doesn’t bother us, but there were flash flood warnings, lightning warnings, high wind warnings, and hail warnings. After those scary nights in Glasgow and Hazelton, we decided it might be wise to be indoors during such a storm. We called a few hotels and Ted negotiated a sweet deal with Fairfield Inn. We bought perishable food for dinner so immediately after checking into the hotel, we headed outside to the picnic table in the parking lot. We definitely got a few “why are these hobos cooking on a camp stove at our nice Fairfield Inn” looks, but we’re getting used to being the dirty, weird people that ruin the aesthetic of nice places. We nearly beat the storm, but as we were finishing up cooking, a short, but powerful wind storm blew over / away our whole operation. Luckily we were holding onto the pot at the time so our food survived, but everything else went tumbling. Our flimsy plastic pot lid went flying through the air like a frisbee, then rolled all the way across the gigantic hotel parking lot. After retrieving everything, we headed inside to eat, feeling justified about our decision to pay for a hotel. I have a somewhat embarrassing confession to make: my favorite part about staying in a hotel, on this trip and in real life, is watching HGTV. I know it’s all staged and that each episode of every show follows the same formula, but I enjoy it anyway. We don’t have cable, so hotels are my only opportunity to watch HGTV, therefore I may or may not uncontrollably binge. Not today, though. A big storm means cable doesn’t work, so I was forced to do more productive things like blog and read. Unfortunately, despite not having TV to distract us, we still managed to stay up much later than we should and we have a 118-mile day ahead of us tomorrow. I have a feeling coffee will be part of our day tomorrow. I met Richard in Gackle. His approach is very refreshing….just do it!